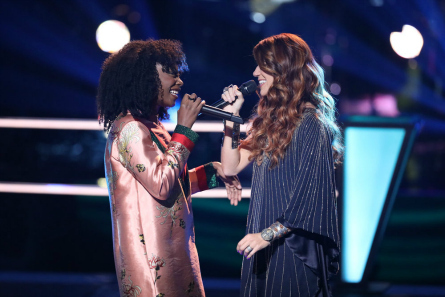 “The Voice” season 14 coaches came-through once again with some phenomenal advisors to help coach their teams through the treacherous terrain of ‘Voice Battles! Alicia Keys brought-in Shawn Mendes, Adam’s avisor was Julia Michaels, and Kelly had Oscar nominated actress and Pop Star – Hailee Steinfeld. Legendary Country artist Trace Adkins advised Team Blake. 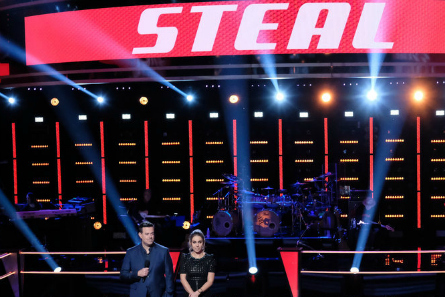 For the first time on “The Voice”, viewers will see when the artists find out who’ll they’ll be battling and see their reactions! 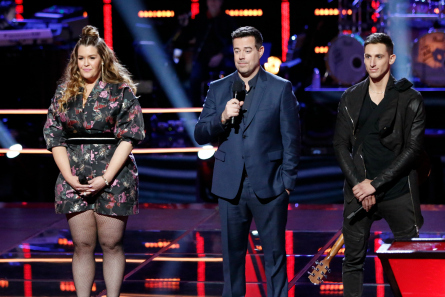 The show also promised more time spent between artists, coaches and a team of voice coaches and choreographers this season, though I kind of suspect that has always been the case. 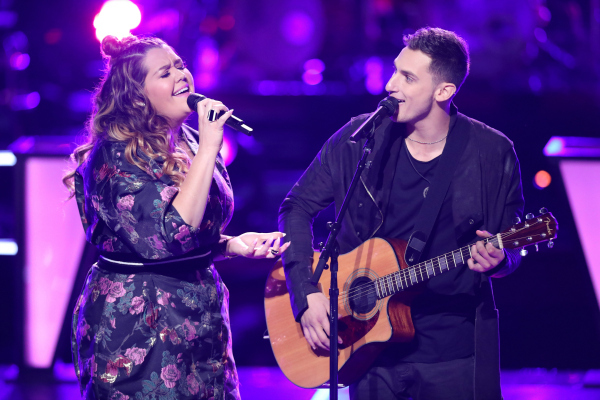 At the start of the Battles, Blake warned Kelly that the Battles are “painful and hard!” The first artist from Team Alicia was Jamai who was about to find out who he’d be Battling. Jamai was worried when he found out he was battling Shrane, because “she might send me home.” Alicia said Jamai has so much soul and “it will be a good Battle.” Alicia picked 19-year-old Shawn Mendes for her Team’s mentor. They chose to sing his “Mercy” song. Mendes called Sharane “flawless” and said Jamai was able to “shred his voice and come back.” He said they “slayed” his song. Alicia said all they need to do is make it mean something more within that space and that’s who’ll win. 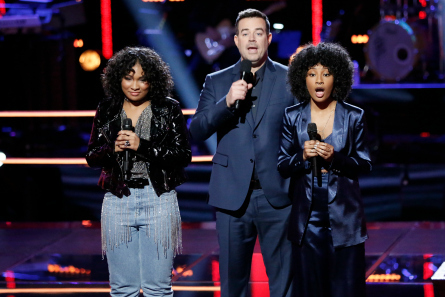 After their Battle perfomance, Adam said he loves them both and Sharane has a special quality, a voice that “fills a room.” Kelly reacted to Jamai, “you have some sick runs”, and Sharane has what Alicia has – that she has ten lives and currently on her eleventh. Coach Alicia said Jamai has “grown exceptionally”. Sharane has lived 11 lives, yet she’s only 24 years old. Alicia had a tough time choosing the winner as Sharane! Kelly said they are both Indy rock which is why she paired the two. Blake said Brynn doesn’t sound like anyone else and could see her being on the radio. He added that she has a lot of power and energy at only 14-years-old. Coach Kelly said Dylan has a “magical presence on stage.” She said Brynn is an “old soul” and captivating. STEAL – Blake Shelton stole Dylan because – it’s hard to deny his enery, stage presence, and he’s a great vocalist. Kelly reacted to the Battle, that said she’d never in her life want to sing with Kyla due to her powerhouse voice. Adam agreed and said Kyla’s singing made him feel “Bashful.” Kelly said she’s a fan of Kyla’s. Alicia said it was a beautiful testiment to JessLee’s Country influence. Alicia told Kyla her not to subdue her greatness. and encouraged her to “never do that please.” Coach Blake said Kyla has been a background singer. JessLee naturally had “the attack” that Kyla needed. Blake chose Kyla as the winner! He said because they haven’t discovered the limits to Kyla’s range. Tish said music has been her therapy She said she feels that Adam really “has faith in me,” and she’s living her dream. Tish’s reaction to Battling Rayshun was that Rayshun is going to be hard to beat and reminds her of herself. “We really go for it.” Adam told them that he paired them together because they are so good and it’s good for them. Not good for him. The song they were given was a Chaka Khan song. “Power and perfection” said Adam. After their Battle, Kelly said Tish reminds her of Chaka Khan and Aretha Franklin and she’d like both on them on her team. Blake reacted that Tish is a phenomenon and Rayshun has more stepping-up to do to equal her. But, he did it. Coach Adam stated, “I believe this song was more for Tish.” But, Rayshun keeping-up with Tish is almost impossible. “But, it shows me a lot of who you are.” Adam chose Rayshun as the winner Rayshun was surprised! Adam said there’s just something about Rayshun that’s so special. He has range, he has everything. STEAL – Kelly pushed her button to steal Tish. She reminded Tish that she was the other coach that turned for her. Kelly said and artist that sound like Aretha and Chaka shouldn’t go home. Adam told Christiana that there’s something that draws him, and she has great vocals. With Shana, he said, the moments that were powerful, were really, really powerful. He went with Christiana. Kelly said it’s interesting that they’re both on the same team. Christiana has a calm Nefertitiness about her. Blake said Shana literally cast a spell on him. Alicia said “I love this version of this song” and love that they could deconstruct it and take it to antoher place. The winner was Christiana. Alicia said it was her favorite Battle. “DR is a “Stunner,” and Jackie’s warmth that is hard to find in a voice that occupies a higher space. Adam said “that was a special, speical thing. You’re both astonishing.” The real revelation, Adam said is Jackie. Blake said there’s so much pressure and confidence that Jackie and D.R. has “goes a long way.” He told them, “I can’t tell you have far that will take you.” Blake agreed that Jackie was “the discovery here.” Coach Kelly said she loved both of them. Kelly named the winner as D.R. Kelly said D.R. is a powerful singer. He’s bold and willing to go somewhere with song selection. Amber is a background vocalist for Natalie Cole, and has never been a solo artist. She moved to Los Angeles from a small town. Amber was excited to learn she’d be Battling Jorge. She said she’d have to make sure that she’d match his vocals. Jorge moved to America from Mexico two years. The two sang Hailee and Zedd’s song “Starving. Kelly said she chose the song because – “I thought they’d bring a lot of life to that song.” Hailee advised them to give positive energy and walk around the stage. Adam said for Jorge to maneuver around and keep all his notes, etc. He thinks he’ll go far. For that, Adam went with Jorge. Blake said Amber has staying power and looked like she was having fun. He voted for Amber. Kelly was glad that Jorge brought the guitar into play. Amber impressed by singing some Spanish. Kelly went with her gut and name Jorge at the winner of the Battle. Kelly said she likes that Jorge is Bilingal and that will come into play. Blake said it’t Davison’s tool to dip into his falsetto and come out. Kelly called Davison’s runs like butter on a warm biscuit. Alicia loved how it was an unexpected song for Reid. It fit his vibe, and Davison was able to “own it.” Adam said Reid has an incredible confidence, which needs to rub-off on Davison. He called it the “right pairing.” Adam chose Reid as the winner. Adam said Reid was just more ready. Jordyn goes to a musical arts college. Kelsea has always loved to sing. Her grandfather, who inspired her to pursue music, recently passed away. They sang “Don’t Let Go” by En Vogue. “They seem similar, but their styles stand-out,” said Alicia. Mendes noted that Jordyn had a full grown woman come out of her when she sang. He said Kelsea is a super-star. He said they are both stars and will possibly be the best performance of the night. Alicia said you can hear their indviduality. Kelsea said no master class compares to having instructions from Alicia Keys. Alicia said whoever puts the work in and shows evolvement is who’ll win. Adam reacted that Kelsea’s overall confidence level was great. But, would probably go with Jordyn. Blake said they were evenly matched. But, Kelsea has they scratchiness, and went with Kelsea. Kelly also went with Kelsea. Coach Alicia said though Kelsea is hyped-up about singing, she also has tremendous grace. She chose Kelsea. Alicia said there’s something really special about Kelsea. Her voice has a warmth graveliness. STEAL – Adam and Kelly both tried to steal. Adam said he “paved the way.” He said he voted to go with Jordyn in the Battle. Kelly said if she doesn’t pick her now, she’ll try to steal her later. The other coaches chimed-in for Kelly to fight now. Kelly came back with the fact that she won a singing compeition (“American Idol) at 19-years-old. Adam said he pressed his button before Kelly. Jordyn chose Adam as her new coach. Adam said she’s really good and at 17, has a lot of work.